Ammonia - Functions by opening the scales of hair, to allow the penetration of the real dye. Oxygenated Water - Functions by eliminating the natural pigments inside the hair and activating the dyeing substances,so that once they are oxidized, they fix themselves inside the fibers. Organic pigment substances (amino-phenole, aromatics diamine): these aren't themselves dyes, but intermediate products, that after the oxidization, become dyes. Dyes formed in this way fix themselves on the keratin of the hair, so that they aren't soluble either in water or in the most common organic solvents. 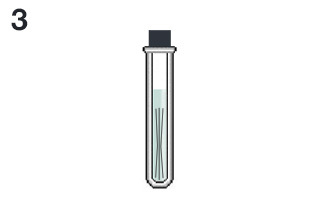 The proposed assay for determining existance of a dyeing substance is based on the properties of the Thioglycolic Acid. This acid is able to interfere in the chemical bonds (hydrogen bridges), that constitute the structure of the rolling (secondary and tertiary stuctures) of the keratin, the protein that constitutes the hair. By destroying, even partially, the above mentioned hydrogen-bridges (bonds), we can obtain an opening in theith the pigments naturally present in the hair, as it is integrated to the capillary fiber with more stability than artificially applied colour. Moreover, The Test introduces an undeniable advantage in its ease of execution as it is sufficent to plunge the hair in the reagent, which is colourless. If the hair has undergone dyeing through the above-mentioned system, pigment will be released into the acid solution and colour it. 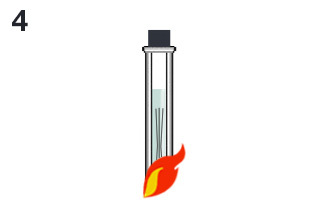 This reaction is accelerated through the application of heat. 1 - Take hair samples from many parts of the dog's coat, including legs, shoulder, chest, belly, head. 2 - Put the hair into a small test-tube. 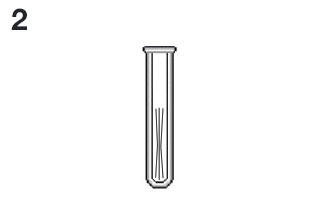 3 - Fill the test tube to the halfway point with the Thioglycolic Acid and close it with a tap. 4 - Heat the tube. Remember when heating the tube to shake it very well in intervals of about 10/15 seconds to prevent breackage. 5 - If the hair has been dyed , you will see the hair begin to lose colour and the un-coloured acid also begin to turn purple (this normally in dogs dyed black). 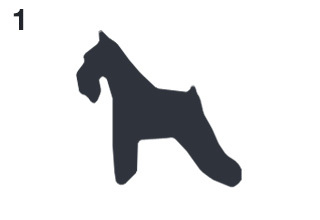 If the dog is not dyed the acid remains transparent (uncolored). The test-colour was discovered by Fabio Ferrari (kennel SCEDIR) to stop the unethical practice of coloring dogs and to push breeders to work towards bettering the colour of their dogs genetically. Use gloves and keep away from children. Don't touch any skin with the gloves when handling the acid.